Stittsville Food Bank – Scouts come through again with another generous donation! 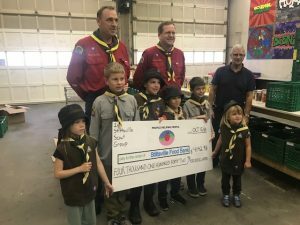 Stittsville Food Bank / Uncategorized / Scouts come through again with another generous donation! The 1st Stittsville Scout Group has been a long time supporter of the food bank and their hard work and generosity is greatly appreciated by the food bank. Some of the group dropped by the food bank to donate the money they collected on their annual food drive. Thanks Scouts!